UU A Way Of Life: Are there "old souls" in your congregation? 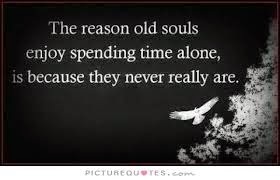 Are there "old souls" in your congregation? As we continue to consider the third principle of Unitarian Universalism, “acceptance of one another and encouragement to spiritual growth in our congregations,” we might consider a bit more deeply what this thing about encouragement to spiritual growth entails. For the most part, it might just entail tolerance and forbearance when it comes to beliefs different from our own and simply listening and validating the person’s search for truth and meaning as is stated in UUs fourth principle. Is this encouragement a peer to peer thing or is it also a superordinate to subordinate thing? In other words do the elders have anything valuable to share with the adults, the teens, the children? Is this encouragement to spiritual growth a transgenerational phenomena based on chronological age, life experience, or perhaps stage of faith development, using a model like Fowler’s for example, which has been achieved? I suspect the encouragement to spiritual growth comes more from what Edwin Friedman, one of Murray Bowen’s students and colleagues, called “differentiation”. To what degree has the person become his or her own person, with a mind of his or her own, able to stand on his or her own feet, captain of his or her own ship, and master or mistress of his or her own fate? Is he or she aware of what makes him or her tick or is he or her victimized by emotional forces and beliefs that he or she is not aware of, does not comprehend? The degree of differentiation a person has achieved in his or her life is directly related to his or her mental health and level of consciousness and functioning. People who take differentiated positions and stands on their values and beliefs tend, while their positions and stands make cause conflict, to enhance the functioning and wisdom of the group. This type of “encouragement to spiritual growth” has more to do with how people participate and function in emotional systems than any kind of cognitive knowledge that gets transferred. This growth is facilitated through participation in interpersonal relationships in which there is some emotional investment where one or some people function at a higher level of consciousness and mental health than the norm for the group. Jesus and his ministry as outlined in the New Testament is a good example of this kind of encouragement to spiritual growth where He set an example and continually said to His followers in one way or another “come follow me.” My favorite story that exemplifies this dynamic is when the rich young man comes to Jesus to ask what he must do to gain eternal life and Jesus says simply, “follow the commandments”. The rich young man replies that he already does that and feels that there is something more and Jesus says in so many words, “Well, if you are really serious about this, you should sell all your possessions, give the money to the poor, and come follow me” and the gospel says that the rich young man looked sad at this response and walked away. Spiritual growth is not for everyone at particular times in their lives. They have been captured by materialism, what A Course In Miracles calls “special relationships”, and other worldly concerns on the ego plane which they don’t want to give up. At these times, people involved in religious activities do so for the social benefits not the spiritual, and so much time is wasted on congregational participants who aren’t really serious about developing and enriching an interior spiritual life. When it is offered, like the rich young man, they become sad and walk away. There are some people in UU congregations who have been reflecting on, and learned from, the curriculum they have been taking at the University of Hard Knocks. They may have obtained their Ph.Ds. There are other people who have only begun, and those who have yet to begin their studies. Encouragement to spiritual growth requires that we take people where they are at not where we want them to be or think they should be. If we are to be of help, we need to have some sense where people are at. What are the milestones, the signs of spiritual maturity? If we can name them we can work towards them ourselves and we can assist others. What are the indicators of spiritual maturity that you find helpful in ascertaining where you, yourself, and others are at? Are there qualities, characteristics, signs that would tell us the level of spiritual maturity? Jesus tells us, “by their fruit you shall know them,” but what fruit one could ask? What kind of fruit are we looking for? Jesus says simply, “Love as I have loved.” How loving is your congregation? How is it manifested? How could your congregation increase and enhance its levels of loving? What could you do to contribute to and enhance the amount of love in your congregation? Do the elders have more love than the adults and the teens and the children? I suspect that if they have matured in the spiritual life they certainly have. In colloquial speech, we sometimes say that people have “mellowed” in their older age and yet sometimes their dysfunctional behavior deteriorates further. Chronological age has little to do with spiritual maturity. There are young people who sometimes get recognized as “old souls.” Who are the mature souls in your congregation? How do they facilitate the spiritual growth of the other congregational members? You seem like an old soul.